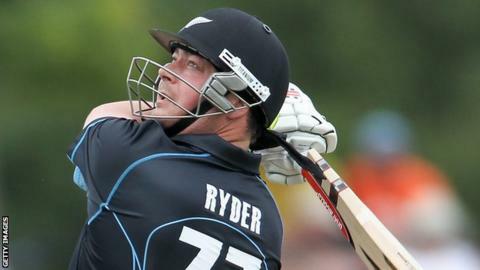 Essex have signed New Zealand batsman Jesse Ryder to play in all formats this season, pending a visa application. The 29-year-old has an average of 40.93 from his 18 Tests and has played 48 one-day internationals and 22 T20s. He has had a troubled career, most recently being dropped from the Kiwi Test side in February after a late-night drinking session. "I'm thrilled to have been given the opportunity to represent Essex," said the Otago batsman. "This couldn't have come at a better time as I want to get as much cricket as possible over the New Zealand winter. "The side looks very strong and they have got off to a good start for the season." Ryder, a left-handed batsman who can also bowl right-arm medium pace, will be available for County Championship Division Two side Essex from the beginning of May. He has not played in a Test match since facing Australia in late 2011, but had re-established himself in the one-day side up until his latest indiscretion. Eight years ago he was sacked as Ireland's overseas player after failing to turn up for a game, while in 2008 he missed two Tests after severing a tendon when trying to break into a locked toilet in a bar. In 2012, Ryder announced he was taking an indefinite break from the game, although he soon returned to play in the lucrative Indian Premier League. And just 13 months ago, in March 2013, he was assaulted outside a bar in Christchurch and placed in a medically-induced coma after suffering a fractured skull and severe internal injuries. After recovering, he had to serve a six-month doping ban, having tested positive for two illegal stimulants after taking a dietary supplement to aid weight loss.